It is critical for students in grades K–2 to master foundational reading skills so that, in future grades, they can focus their attention on reading to learn as opposed to learning to read. Pathways now offers resources to support instructional design connected to the Reading Foundational Standards. These resources allow teachers to take a more targeted approach to designing foundational reading instruction. Teachers can explicitly practice individual phonics and fluency skills at varying levels of mastery in order to meet emerging readers at their unique stage of reading development. As with all of the resources in Goalbook Pathways, we’ve incorporated the most relevant research and best practices around developmental levels and instructional practice. 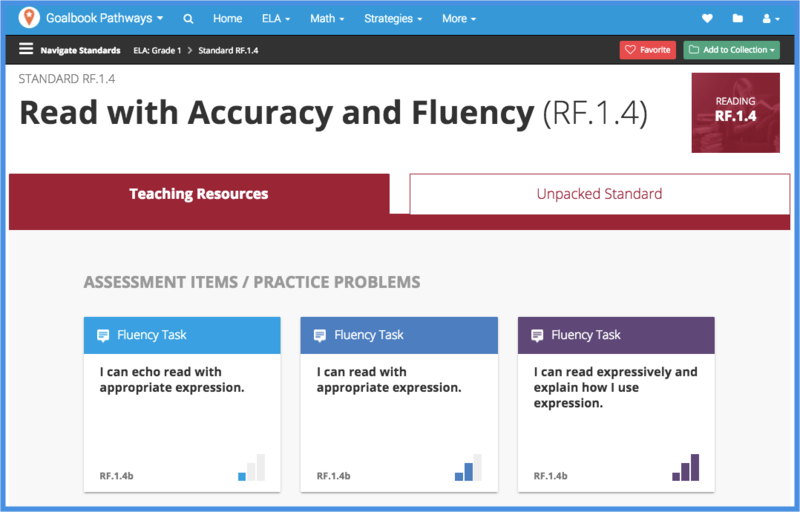 The newest fluency assessment items support leading research around building fluency by implementing the practice of repeated reading. By using the same text in all three items of a progression, students have multiple opportunities to exhibit mastery as they progress from most scaffolded to least scaffolded (DOK 1–3). The DOK level 1 assessment item for this standard also supports proven research around the importance of modeling. Students need a model of fluent expressive reading in order to effectively develop their own skills. All three items at each DOK level serve as an instructional design model for teachers to know how students should demonstrate mastery at varying levels of complexity. This is especially important for foundational reading skills because they are generally taught in ways that don’t require students to explicitly demonstrate their understanding. At the DOK 1 level, the student must engage in the cognitive activity of reproduction. They echo read and do their best to match the expression and intonation of the teacher. At the DOK 2 level, the student must engage in the application of the skill independently. Without assistance, they should be able to read with expression using punctuation and context as a guide. At the DOK 3 level, students must provide adequate justification for their application of the skill. They should be able to describe their choices around intonation and expression after they’ve read the text so that it’s clear when they are simply parroting expression versus when they are making sense of their oral reading decisions. These strategic levels of complexity ensure that teachers have a model to address foundational reading instruction from every angle, especially with students who don’t seem to naturally pick up these foundational skills independently. Learn how to access the new Reading Foundational Standards pages in Goalbook Pathways!